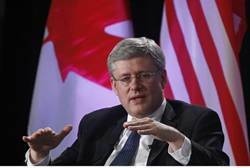 Canadian PM Personally Intervened to Stop PA Statehood Bid at UN — 1389 Blog - Counterjihad! Canadian Prime Minister Stephen Harper personally intervened to pressure Palestinian Authority Chairman Mahmoud Abbas to drop his bid for upgraded status at the United Nations. Harper, who had been in New York to accept an award and attend the opening of a new session of the United Nations at the end of September, had “a short, brusque meeting with [Palestinian Authority President Mahmoud] Abbas,” the Globe and Mail newspaper reported. “In a little room at the United Nations, Mr. Harper skipped most of the pleasantries in a 15-minute meeting, according to sources briefed on the session, and told Mr. Abbas he had come to deliver a message: If you keep doing what you’re doing, he said – referring to the Palestinian bid for upgraded status – ‘there will be consequences,'” the newspaper reported. “It was just one part of the bare-knuckle approach Canada has taken toward the U.N. bid, though largely out of public view,” according to the newspaper. Abbas, who is set to appear before the U.N. General Assembly on Thursday, will be beseeching the international body to grant the Palestinian Authority Observer status, thus enabling it to achieve de facto status as a sovereign state and effectively circumvent final status negotiations with Israel. The status, if granted, would grant the PA access to the International Criminal Court at The Hague and other similar bodies, which would enable it to pursue “war crime” charges and other grievances against the Jewish state. In addition, Foreign Affairs Minister John Baird has told several people, including Palestinian Authority representatives, that he would travel to New York personally to cast a vote against the bid. There are more serious potential aspects to the “consequences” about which Harper warned, namely that Ottawa, which had pledged $300 million in aid over five years to the PA starting in 2008, could refuse to grant the generous sum again, as the period is about to run out. Harper has long been recognized a strong friend of the Jewish state. “[W]hen Israel, the only country in the world whose very existence is under attack, is consistently and conspicuously singled out for condemnation, I believe we are morally obligated to take a stand,” Harper said last year. Harper said Canada must oppose demonization, double standards and de-legitimization. “Not just because it is the right thing to do, but because history shows us, and the ideology of the anti-Israel mob tell us all too well, that those who threaten the existence of the Jewish people are in the longer term a threat to all of us,” he said. “Whether it is at the United Nations or any other international forum, the easiest thing to do is simply to just get along and go along with this anti-Israel rhetoric, to pretend it is just about being even-handed, and to excuse oneself with the label of honest broker,” Harper added. How many people of principle are left in the West now? Next post: If At First You Don’t Secede, Try, Try, Again!